Uttar Pradesh Public Service Commission announced Revenue Inspector exam date 2014. All candidates can download the admit card online form official website. The Uttar Pradesh Public Service Commission (UPPSC) invites the various notification for filling Rajasva Nirikshak (Revenue Inspector) posts every year. Total 617 posts available there. This year also the Uttar Pradesh Public Service Commission was announced the notification for recruitment 2013-14 on its official website at www.uppsc.up.nic.in. A large number of interested and eligible candidates have been filled the application form via online mode. The filling process is under process. It will held between 16 September, 2014 to 16 October, 2014 (EXTEND DATE is 15th November 2014) and the last date for deposit fee at bank is 13 October, 2014. After filling process the UPPSC will announced the Rajasva Nirikshak (Revenue Inspector) Exam Date 2014. The admit card or call letter will be available before 15 or 17 days of the written examination. 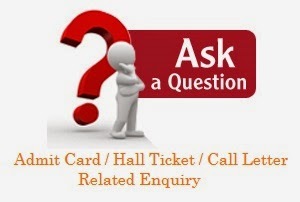 Before explaining you that instructions to downoad your admit card, I would like to tell you that every step which I am going to explain you, should must be followed correctly so that you can get your admit card easily. Step-1:- Go to Official website of UPPSC - by clicking here. Step-2:- There you will find an option at the left sidebar written as " Download Admit Card for P.C.S Mains Examination 2014 " click on this option. Note:- You can also go there direct by clicking here. It will take you to the page where you can download your admit card by filling your details like Registration number, date of birth etc and then enter the varification code given there. The posts name are:- Rajsav nirikshak / Revenue inspector / Kanungo Posts. UPPSC kanungo exam will be conducted in 2 shifts. First shift will start from 9:30 AM - 11:30 AM & 2nd shift will start from 2:30 PM - 4:30 PM. There you will see two papers in the written exam, consisting of 200 marks each. 617 posts of Revenue Inspector ( Kanungo ). Uttar Pradesh Public Service Commission (UPPSC) (Hindi: लोक सेवा आयोग, उत्तर प्रदेश) is the state agency authorized to conduct the Civil Services Examination for entry-level appointments to the various Civil Services of Uttar Pradesh. The agency's charter is granted by the Constitution of India. Articles 315 to 323 of Part XIV of the constitution, titled Services Under the Union and the States, provide for a Public Service Commission for the Union and for each state.